Edge banding is a simple, low-cost addition to make doors and panels stand out, especially in pieces from the Federal period. Last week I showed how I added edge banding to my tall clock. As I trimmed banding flush to the panel and door, I flipped a corner area out which called for a repair. This week I’ll show a simple fix, then give you a couple ways to rout in string grooves to hide where the banding and veneer meet. 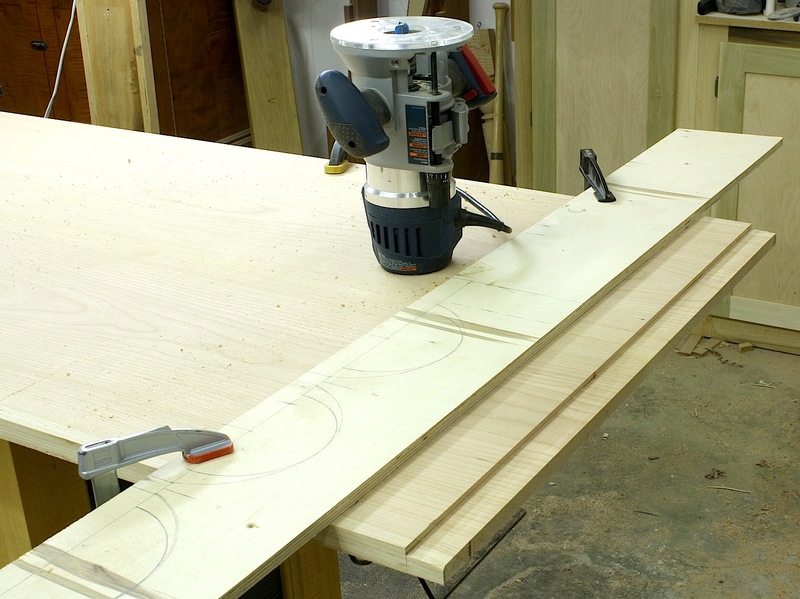 To trim banding flush, as you may expect, I use a router and flush-cut router bit with a bottom-mount bearing. I learned years ago that if you expect edge banding – short pieces positioned so the grain runs perpendicular to edges – to keep from massive destruction, you better climb cut as you trim – you are trimming end grain. As I worked on my tall clocks, I learned another valuable lesson; Cut straight in at your corners. I made a climb cut along the bottom edge of my door panel, and as I began the cut the bit flipped out part of the corner. If you push directly in at the corner – follow the mitered line formed at the corners – the pressure of the cut is such that your banding stays intact. If you look at the photo above you may think that little bit of missing banding is not a big deal. In fact, there is a small piece gone from both mitered corner pieces. The left-hand missing piece is small enough to be hidden by a piece of stringing yet to come, but with the right-hand piece I was not so fortunate. Thus the repair. I know I’m not providing any earth-shattering technique never seen before as I demonstrate this fix, but that is the point. Edge banding is easy to do, and edge banding repair is simple. (We are woodworkers, if it was difficult or hard we would not do it.) To fix this defect, draw a line with your pencil of marking knife then cut away a small piece of banding. If possible, undercut the edge as you work to make sure you get a tight fit with your patch. Find a piece of leftover banding that has a similar grain match – this should be easy to do because all your banding pieces are cut from one or two pieces of scrap as shown in the previous post – then glue the patch in place. After the glue dries, trim the patch flush with your edge. Simple, huh? Where your banding and veneer meet is where you plow the groove for stringing. I suggest a couple different setups depending on what tools you have available. 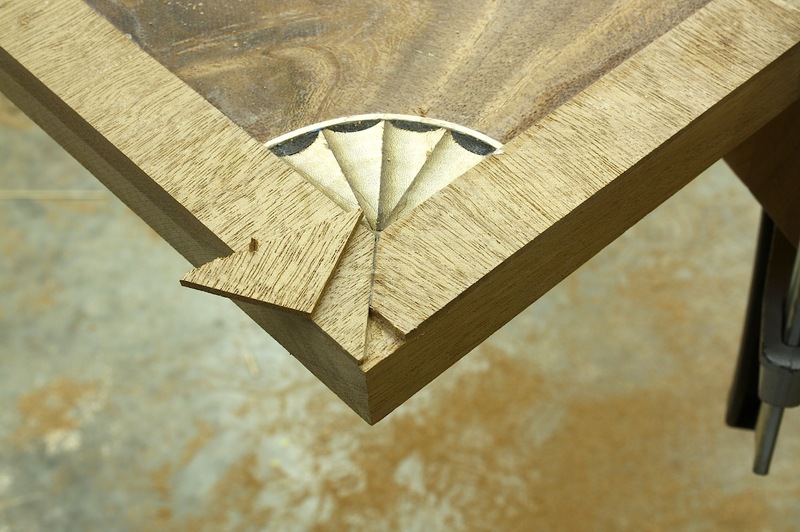 If you have a guide fence to fit your router, install a 1/16″ straight bit in your router, position the bit so your groove splits the banding/veneer intersection then make your cut, as shown in the top photo below. If you do not have a fence that fits your router, then you need a guide bushing and a shop-made straight edge, as shown in the lower photo. For this operation, you need to calculate the measurement from the edge of your guide bushing to the center of your router bit, or how far from the intended groove you need to affix your straightedge in order to cut the groove at the banding/veneer intersection – off course, this depends of your bushing. This is easy-to-do woodworking with spectacular results. Give it a try. It works just as great on small boxes, too. 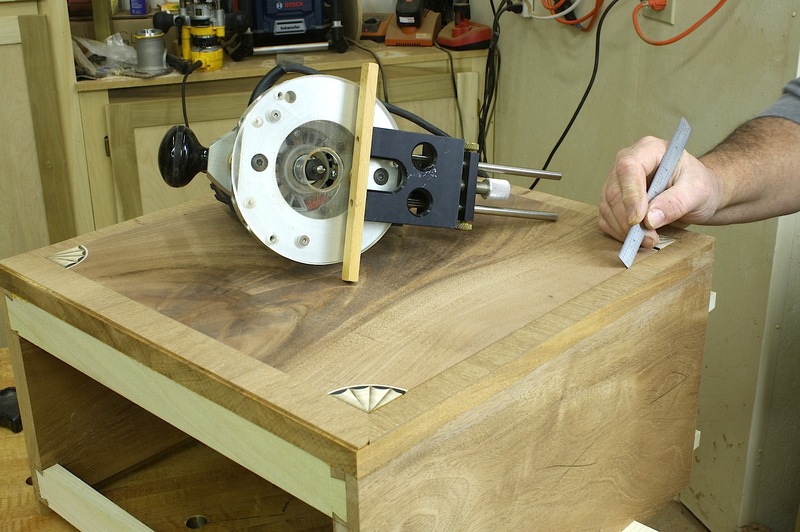 A Router Jig, or a Ingenious Method of Work? Those of you who read this blog know my penchant for routers. My router, and a circle-cutting jig, made easy work of the inlay on my clock base, as shown at the left. Circle jigs are not used on every project. In fact, they are not used on most projects, but when you need one, it’s nice to have options. 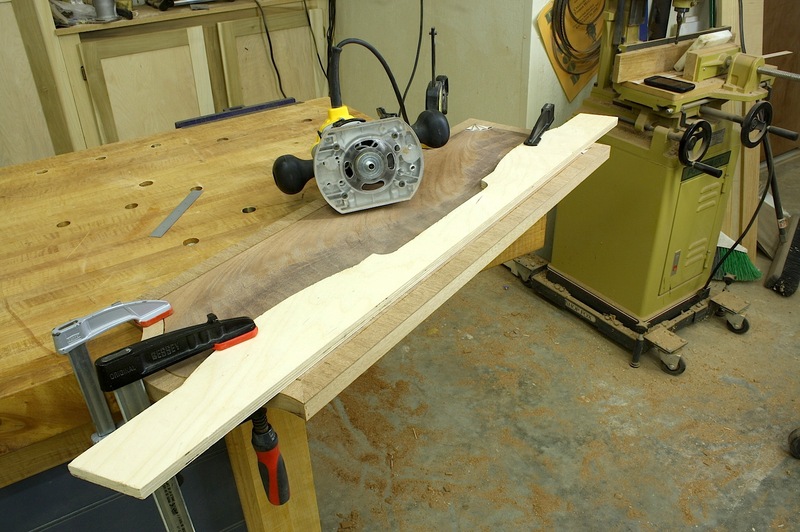 Recently, I teamed up with Popular Woodworking Magazine for a new router-based DVD. 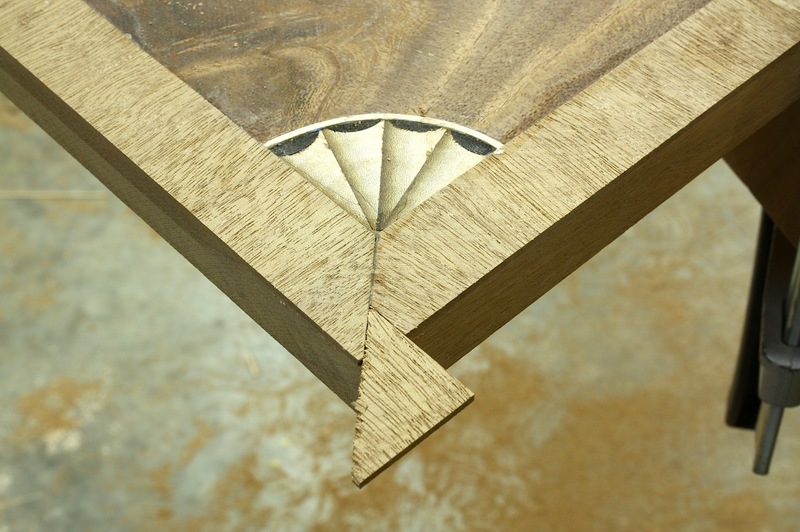 “Router Joinery & Techniques with Glen D. Huey” is available as a DVD or a digital download. Click here to pick up a copy. In the DVD I talk about and demonstrate using circle-cutting jigs. There are jigs that replace a router base-plate and those that work with router bushings. These jig designs work in different ways so it’s good to have both in your shop. But there is a circle-cutting jig in your shop already and you may not realize it’s there. 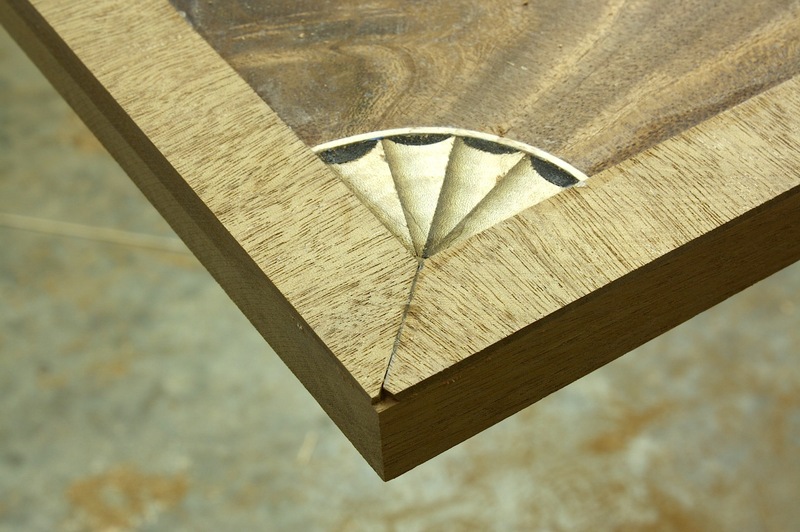 I also used my router to cut the quarter circles for my fan inlay. At a 1 1/2″ radius, I could not use circle-cutting jigs as they are normally used. To make these cuts I drilled a hole in my router base then swung my router in an arc. 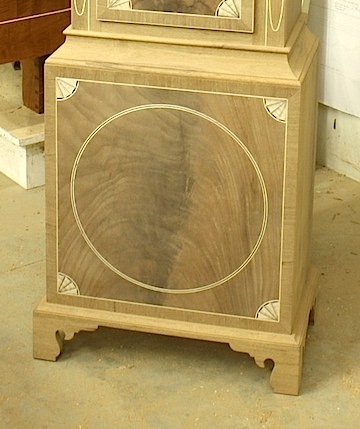 I began with a veneered panel attached to front of my clock base. (I had my veneer bonded to a backer to make life easier. Bonding to a cross-grained back allows veneer to be worked and stored more like boards – no veneer softeners, newspaper layering or time lost waiting.) Before moving on, I used a straightedge and a pattern bit to create an area for edge banding. Pin placement was a snap. I used a Czeck Edge Birdcage awl to start my hole – really like this tool – then drilled for my pin. Measured 1 1/2″ from a 1/16″ inlay router bit toward the outside of my router plate, then drilled a hole the same diameter as my pin. The router slips right over the pin and because I was cutting in from the edge-band area, there was no need to plunge my cut. All I had to do was flip the router switch to the “on” position and rotate my router through the cut. A perfect 1/16″-wide, quarter-circle groove was made. With the grooves complete, I cut and installed my edge banding, installed stringing that straddled the veneer and edge banding to cover my seam and to define my fan area, then used my router again to waste away the fan area before installing the sand-shaded fans. Is using the router plate as I did considered a jig? Is it an example of “out of the box” thinking? Or, is it a standard router technique? I cannot remember the last time I built a table or larger counter where I didn’t use breadboard ends to help stabilize the top to lessen warp, and to hide end grain which dyes or stains darker. Of course, these ends can be added to a top in several different methods. I’ve seen ends nailed in place – it’s my opinion that these were simply to hide end grain because there is little in place to keep a top flat. I have seen other breadboards also nailed in place that use tongue-and-groove joinery which is a step better to reduce warp possibilities, but still lacks in good holding power. At the opposite end of the spectrum, some woodworkers attach ends using a sliding dovetail joint – all hail the woodworker that has too much time on his hands. The method I prefer employs both a tongue-and-groove design to keep the top flat, and mortise-and-tenon joinery. The best of both worlds. This design, however, requires more work. A wide tongue, which is made at each end of a table top, is shaped to form the tenons. A matching breadboard end is then fit in place. To form the tongue, I use a router and a straightedge guide. To create the tenon effect, I outfit my router with the proper bushing and router bit then complete the work as shown in the video below.